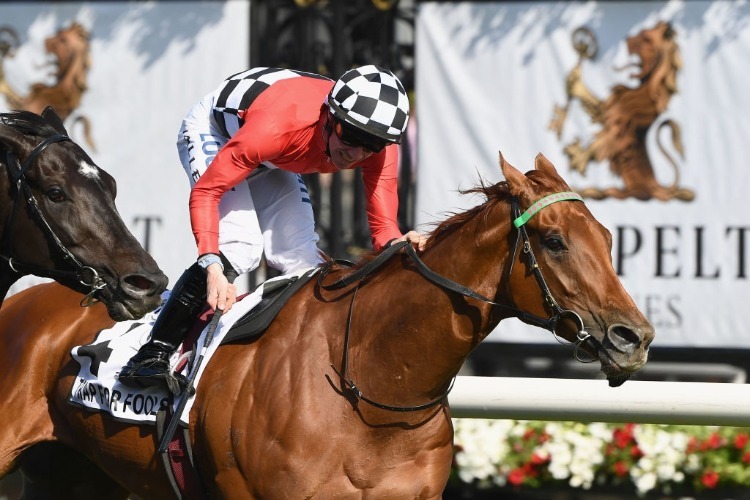 Trap For Fools has held off Irish Derby winner Latrobe to win the $2 million Group One Mackinnon Stakes at Flemington. Trainer Jarrod Mclean has secured the first Group One win of his career with the victory of Trap For Fools in the Mackinnon Stakes at Flemington. Running his own team of horses at Warrnambool, McLean also overseas the Darren Weir stable at the seaside town. Weir and McLean have been a formidable team since joining forces with Weir numbering 22 Group One winners from the Warrnambool stable. While the word team is bandied around, McLean said there's some extra satisfaction coming from Saturday's win, especially the winner's percentage. Continuing the successful spring for jockey John Allen, Trap For Fools ($26) held firm to score by a head from Irish Derby winner Latrobe ($5.50) with Victoria Derby winner Extra Brut ($4.60) a short-neck away third. "It's a huge thrill today," McLean said. "How good has John Allen been riding this week and I'm really thrilled to win my first Group One with him." However not everything has gone smoothly for McLean over the spring. Trap For Fools was scratched from last month's Coongy Cup at Caulfield with Racing Victoria stewards charging McLean over having the gelding stabled at another property prior to that race. The gelding was then left out of the Cox Plate field by the Moonee Valley Racing Club committee before running second to Ventura Storm in the Moonee Valley Cup. "It was disappointing missing the Cox Plate," McLean said. "On that occasion I said things happen for a reason and maybe this was meant to be." McLean praised Weir and stable staff for their support but his biggest was reserved for Perth trainer Lindsey Smith with whom McLean stays with when he travels Weir's horses to Perth. "He's been terrific to me," McLean said. "He sent me over Cougar Express. Winning a Grand National Hurdle was a big thrill and now I've got a Group One with this bloke." Allen, who won the Derby last week on Extra Brut, said luck had played a role in him securing the ride on the gelding. "Ben Melham and Dean Yendall are both suspended and they both have been riding him," Allen said. "Look, you need a bit of luck in this game and I was lucky enough to get the ride on him today." Trainer Joseph O'Brien said the runner-up had run a gallant race. "You can't ask for any more from the horse," he said. "He is only a three-year-old and was giving away a lot of weight, he has done it the hard way."